10.5" x 7.9" stitched on 14 count. 8.2" x 6.2" stitched on 18 count. It's A Boy! cross stitch pattern... 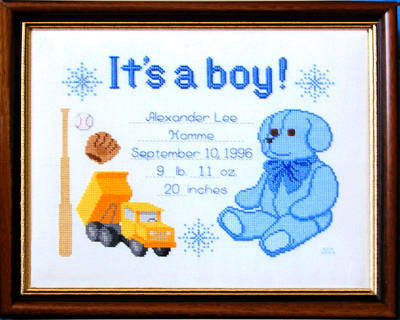 This boy baby announcement shows boy items under the proclamation of Its a boy!. Spaces are provided for the vital statistics, and a blank graph allows for sizing up the information. Satin floss provides highlights.